A beautiful romance can easily flourish in this precious country cottage in the Dordogne. Everything a couple needs is within the four rough-hewn walls of the petit villa. A beautiful romance can easily flourish in this precious country cottage in the Dordogne. Everything a couple needs is within the four rough-hewn walls of the petit villa, but your honeymoon will truly bloom in the gardens, and the countryside beyond. You won't believe your eyes as you swim in the small private pool, the rolling green hills stretching out before you, the flowers in the garden nodding their heads. Use the villa's bicycles to ride to Saint Meard de Gurcon (2 km), a town full of flowers, gorgeous architecture, and award-winning wine. Indeed, you're in the middle of wine country; don't pass over the chance to taste your way through the Bergerac wine region (just follow the Dordogne river toward Bergerac, 30 km away). In the opposite direction you can visit Chateau de Montaigne (15 km), a wine-producing castle where French philosopher Michel de Montaigne was born. An hour's drive will take you to the architecture, gardens, and wine of Bordeaux - La Perle d'Aquitaine. The Bergerac airport is your nearest escape from the region (29 km), but don't fret, this is just the beginning. Come write your love's first chapter in this simple, peaceful villa for two. 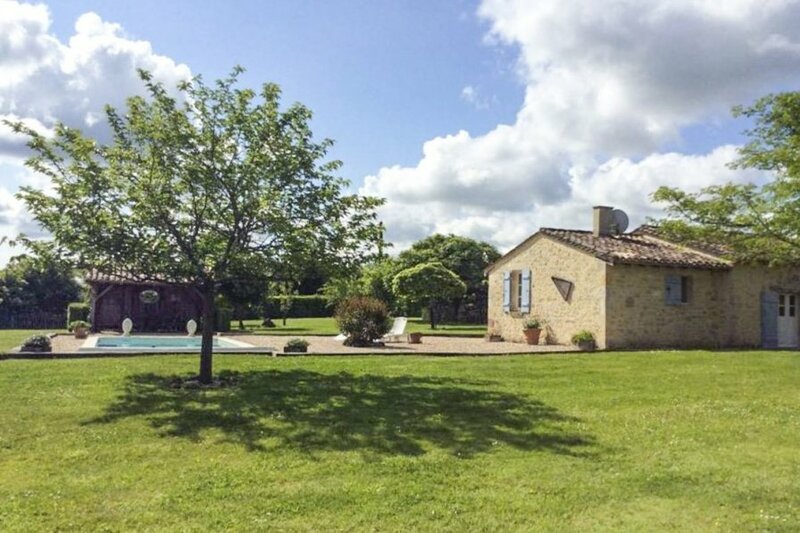 Villa des Anges is strategically set on the Montravel road, in between the towns of Saint Emilion and Bergerac. The closest village is Saint Meard de Gurcon (2 km), with its flower lined roads, a magnificent Gothic church and also renowned for its excellent wine producers. Sainte Foy La Grande, a 13th century bastide town facing the Dordogne river is about 10 km away as is Montpone with its lively Wednesday market. A visit to the world heritage site of Saint Emilion is also strongly recommended. The whole area swarms of tourist attractions and entertaining activities including wine-tasting tours such as the famous Route des Vins de Bergerac, cruises down the Dordogne river, horse-back riding, tennis and golf. The international airport of Bergerac is only at a 40 minutes drive, whereas that of Bordeaux can be reached in one hour.